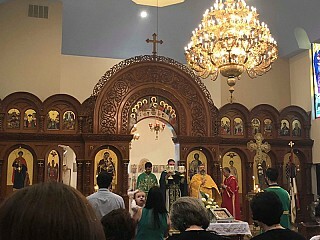 With blessing of His Grace Bishop Irinej, On Sunday, June 3rd, Holy Trinity Serbian Orthodox Church celebrated its feast day and Slava. 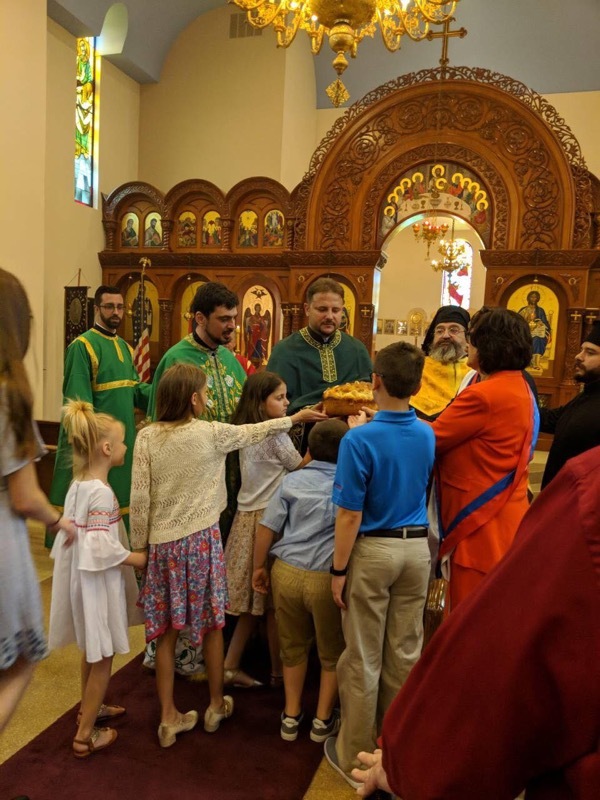 Holy and Divine Liturgy was served and celebrated by the Very Reverend Dragan Goronjic, Dean of the Cleveland Deanery, Very Reverend Protosingelos Sava (Medakovic) and Very Reverend Bosko Stojanovic with help of Subdeacon Mihajlo Pancoe and Michael Lonchar. During the festal procession around the church the celebrating clergy read the Gospels.The service of blessing and cutting of the Slavski Kolac and Koljivo was beautifully celebrated. Mr. Ratko and Mrs. Mira Popovic , served as the honorable kumovi. "HRISTOS POSREDI NAS! JESTE I BICE! (Christ is in our midst! He is and shall be!)" was proclaimed by the faithful gathered. Mr. Stevan and Mrs. Vesna Bevan accepted the honor to be Kumovi for next year's Slava. Led by Kumovi members of the church organizations, and parishioners took part in the preparation and serving of a traditional Serbian Slava meal. The beautiful meal was served in traditional Serbian style in the church hall for all of the faithful attending from many Orthodox parishes across Northeast Ohio and Western Pennsylvania. O Lord and Savior Jesus Christ, continue to sustain our Orthodox Churches, our Bishop Irinej, clergy and faithful and to Thee be glory and praise forever, Amen!